If you are completely new, check out the Getting Started Guide . It will provide you with an easy, step by step walkthrough of joining the project and how it works. 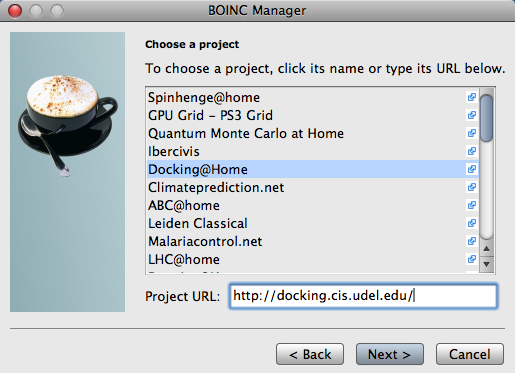 If you already use BOINC, you can attach the Docking@Home project with the URL: http://docking.cis.udel.edu/ . If you've already setup BOINC and started Docking, you can go ahead and Create an Account . An account provides access to posting on the message board, statistics, and other features as you help the project.